Note from Editor: Howard Lamey, in Jacksonville, Florida, has an artist's eye for proportion and charm. He also has the good taste to be one of my readers. I met Howard online when he told me he had used a stained glass pattern from our Free Graphics Resource Page pattern on a vintage-style cardboard church he had built. When I saw the Halloween house featured in this article, I begged him to tell us how he did it, and now we have the chance to share with you. Howard keeps sending me new photos and plans faster than I can get them published, so stay tuned. Locate silhouettes of a ghost, cat, and Jack-o-lantern and print them on yellow bond paper. I got mine from an Internet search. Alternatively, if you want, you can print off the ones that Paul located. He has a version that includes an amber background in case you don't have yellow paper, also. Don't use the "resize to fit" option when you print, or you'll get something way too large to use. If you try Paul's and it comes up the wrong size, download the JPG version and resize it as necessary on your computer. For trees I used floral picks that have a branch-like structure that provides a dead tree look. 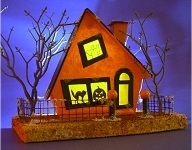 The little "barbs" on the end of the branches are even acceptable for a Halloween house. If the floral picks you use aren't black, brown or gray, you may have to spray them. You'll also have to cut the trunk to the appropriate length, probably with a pair of wire cutters. Eventually you make holes in the base and glue the trunks into the holes. Here's a day shot and a night shot. This building was so popular that we have has started a whole collection called Spook Hill™. 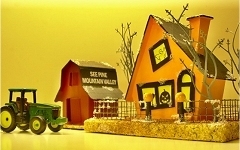 These cardboard vintage-style Halloween building project are perfect for giving your mantle, or your HO, On30, S, or O-gauge railroad a special bit of Halloween cheer. The links below will take you to the buildings in the 2008 series. New, August, 2008! 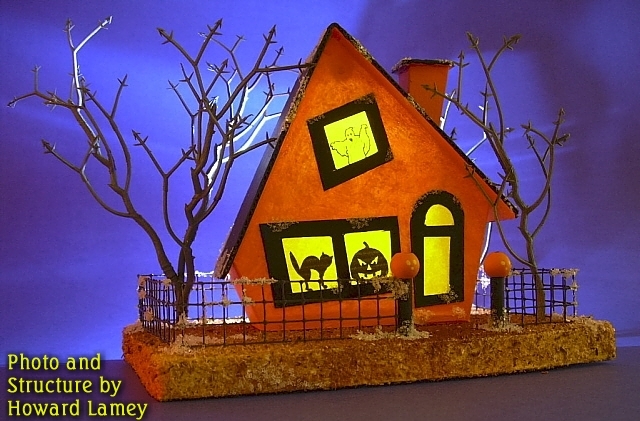 Spook Hill™ #1 - Shakey Pane Manor - Here's a new Halloween-themed building project that based on forms typically used in some of the more elaborate cardboard Christmas houses that were made in Japan between 1920 and 1930. This is the first of our series of Spook Hill™ buildings, enough to give you a fantastic creepy community by October. New, August, 2008! 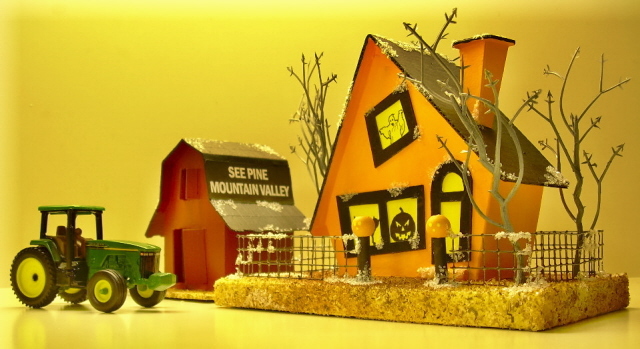 Spook Hill™ #2 - Spook Hill Station - Here's the first-ever Halloween-themed train station craft project. This is the second of our series of Spook Hill™ buildings, designed to look good with Halloween Trains of all kinds, and to get your community ready to receive guests by Halloween. New, September, 2008! Spook Hill™ #3 - Spook Hill Water Tower - Here's the first-ever Halloween-themed train station craft project. This is the second of our series of Spook Hill™ buildings, designed to look good with Halloween Trains of all kinds, and to get your community ready to receive guests by Halloween. Do You Want Your Own Custom Vintage Cardboard House? 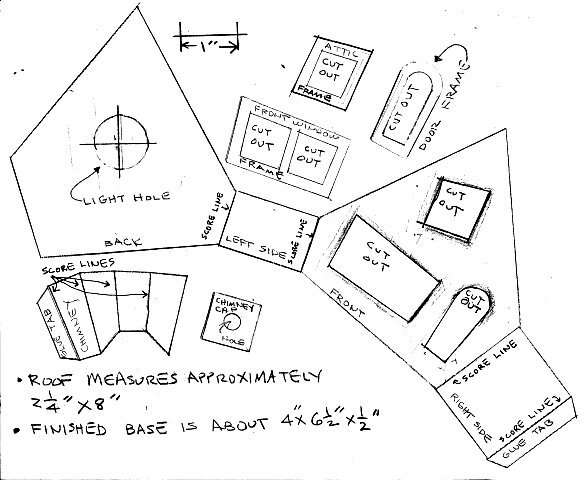 Building a Glitterhouse - Original plans and instructions for starting your own glitterhouse hobby with a simple project. What is a Glitterhouse? 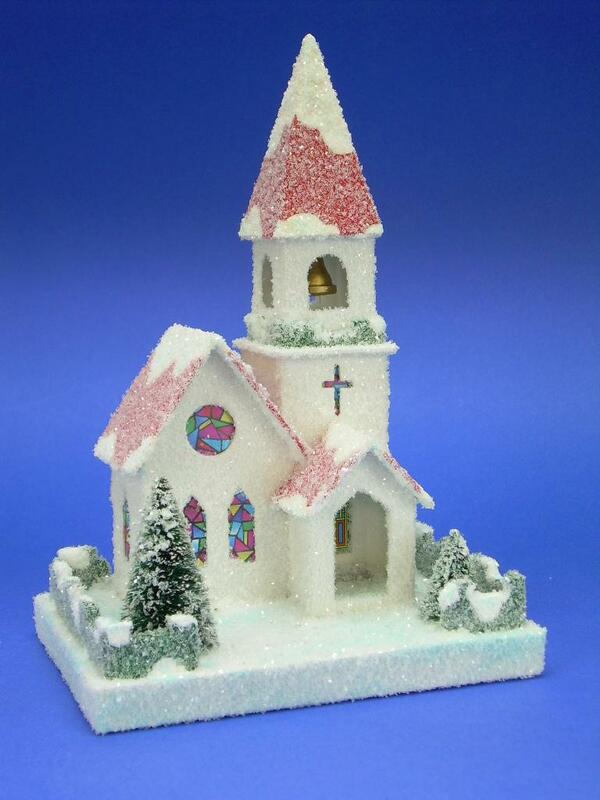 - The BigIndoorTrains™ introduction to the hobbies of collecting and building glitterhouses. To return to the "Howard's How-To" page, click here. Note: LittleGlitterhouses.com™ and Spook Hill™ are trademarks of Howard Lamey, North Jacksonville, Florida. Big Indoor Trains™, Big Train Store™, Family Garden Trains™, Big Christmas Trains™, Garden Train Store™, and Trains and Towns™ are trademarks of Paul Race and Breakthrough Communications (www.btcomm.com). All information, data, text, and illustrations on this web page are Copyright (c) by Howard Lamey and/or Paul D. Race. Reuse or republication without prior written permission is specifically forbidden.